What has started with a wild idea and has been nurtured with the support of many people believing in it has now successfully materialised. 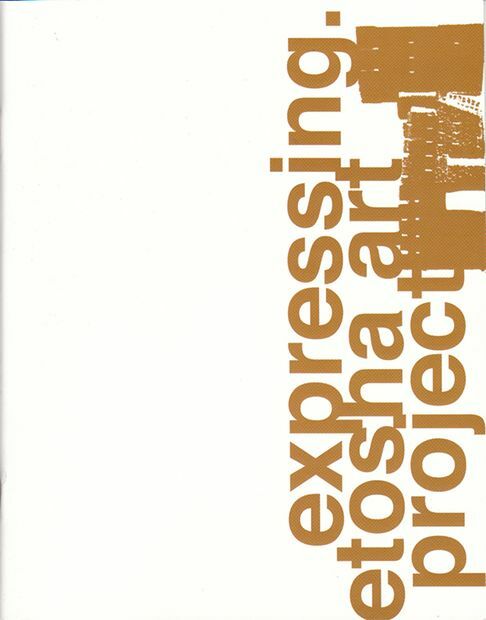 I am proud to introduce the expressing.etosha art project and its catalogue. A group of artists and students have been invited to do site-specific installations in Namutoni rest camp, Etosha National Park. Working on a tight budget, an even tighter time-schedule and a set of challenging logistics these artists have produced amazing works, which can now be appreciated by anybody visiting Namutoni. The works are installed in the natural surroundings of the fort and give the visitors an experience of contemporary Namibian art outside the usual gallery settings. It is an exciting and fresh attempt at constructively combining visual art, conservation and tourism. All this would not have been possible without the incredible support of Rieth van Schalkwyk of Venture Publications, who has been instrumental in getting this project off the ground and supporting it throughout the process and the Managing Director of Namibia Wildlife Resorts, Mr Tobie Aupindi, who graciously agreed to host this project at Namutoni and accommodate the artists during the installation process..
Every big art project is dependant on financial support and we are very grateful that Bank Windhoek Arts Festival kindly accepted to pick up the mayor part of the bill for the projects expenses, while B-Mobile Car Rentals have ensured that we have had a vehicle to take the artists to the Etosha National Park filled up with free petrol donated by Fourways Total Otavi. A special thanks also to the NWR staff at Namutoni, who have welcomed our group with open arms and assisted us in so many ways to make the project a success and Hendrik Smith of Construction Unlimited and his team for their hands-on support on site. Site-specific installations are exciting art forms and have their specific set of circumstances like being exposed to the weather and the fact that one cannot move them to another location. Therefore it was decided to print this catalogue to document the project and artworks, generously funded by Venture Publications and the Embassy of the Federal Republic of Germany in Namibia. Meredith Palumbo Ph.D (author) and Leigh Daniz (photographer) have kindly volunteered their time and expertise for this publication. Last, but not least, I would like to thank the artists and students who have accepted my invitation and created such wonderful and spectacular artworks. I feel greatly honoured and privileged that all of you were part of this fantastic group. Thank you, you have made the project what it is! I would like to extend my deepest gratitude to all co-creators and supporters, thank you that you believed in my vision and have joined forces to make it happen. And all this would mean little if it were not for you: the reader, art lover and guest of our project! Enjoy! Artists have been expressing Etosha in paintings, drawings, and prints for decades; however, the manner in which eight contemporary Namibian artists are celebrating the Park’s centennial in 2007 is unique. Imke Rust, Hercules Viljoen, Shiya Karuseb, Jost Kirsten, Wiebke Volkmann, and three University of Namibia student artists, Helena Iitembu, Lionel Pietersen, and Kleopas Nghikefelwa installed innovative thought provoking site-specific works for the expressing.etosha art project at Fort Namutoni in Etosha National Park in August 2007. The expressing.etosha art project was initiated by Imke Rust, a two-time winner of the Standard Bank Namibia Biennale. The artist drew on her previous curatorial experience and passion for contemporary Namibian art to develop this project. The generous support provided by the Managing Director of Namibia Wildlife Resorts Mr Tobie Aupindi, Bank Windhoek Arts Festival, Ms Rieth van Schalkwyk of Venture Publications, B-Mobile Car Rental, the Embassy of Germany in Windhoek, Fourways Total Otavi and Construction Unlimited has made expressing.etosha the first public contemporary site-specific art installation project of its kind and scale in Namibia supported by a variety of public and private institutions and organizations. The project is an important cultural contribution and artistic salutation to the official centenary celebration of Etosha National Park. Early in June the artists traveled to Namutoni in Etosha to carefully study the site around the historic Fort. While at the Fort the artists investigated concepts and locations for possible artworks, collected materials from the site and considered how the installations could be integrated into the natural environment of the Park. Given the significant and complex history of the Fort, a few of the artists were eager to acquire recycled materials from the Fort and its surrounding buildings’ current renovations for their site-specific works. The artists developed ideas that reflected their consciousness about nature, memory, and history. Before discussing the works created by these Namibian artists, a brief definition of site-specific works and why Fort Namutoni at Etosha National Park is the perfect location for this project will be addressed. During the 1960s artists around the world became more environmentally sensitive, which was indicative of the public’s concern about the pollution and destruction of world’s natural resources. At the same time artists became disillusioned about the commodification of art and the elitist attitudes associated with contemporary art trends. Their solution was to take their work directly to the people and circumvent the museum and gallery system. This brought about some of the first art works designed for a space outside the ‘sterile white cube’ of the established art infrastructure and the intentional blurring of the boundaries between art and non-art. Many artists associated with these site-specific projects used natural or organic materials to create their work, including the land itself. Site-specific works, also called environmental art or earth art, like Robert Smithson’s Spiral Jetty,  and Christo’s Surrounded Islands [1980-83] are incorporated directly into the natural environment. Smithson and Christo’s works are not isolated examples; site-specific works have been installed all over the world, including southern Africa. Works of this type are not unknown in Namibia, a few artists like Trudi Dicks and Helena Brandt have created and installed self-funded site-specific works. One of the primary objectives of site-specific installations like these is to call attention to natural world, to make what has become mundane visible, and to illuminate nature’s plight in the industrialized world. Another objective, equally important, is to bring contemporary art into the public sphere to individuals who do not usually frequent museums and galleries. Many artists even encourage the participation and interaction of the spectator with the work to heighten the aesthetic experience. Given these objectives, Etosha’s is an intriguing location for contemporary site-specific art works. Etosha National Park is Namibia’s flagship resort and one of the leading tourist attractions in Namibia. With more than 200,000 visitors annually it contributes billions of dollars in income per year to the Namibian economy. The Park’s primary purpose is the conservation and the preservation of the natural wildlife and especially endangered species, and this initiative is indicative of Namibia’s commitment to the environment and sustainable development. In addition to this significant endeavor, Etosha National Park preserves and protects the historic fort at Namutoni, a critical site in Namibian history. The fort was first build by the Germans in 1889 and shortly there after was the site of a historic battle between the Ovambo and Germans, which led to the destruction of the fort. Two years later when the Fort was rebuilt, the German Governor Dr. Friedrich von Lindequist, established the region surrounding the facility as a game reserve on March 22. In the following decades, Etosha survived war, neglect, and lack of funding, but in spite of these circumstances the Park has endured and thrived into the 21st century. Currently Namibia Wildlife Resorts is upgrading its hospitality facilities to make the Park a world-class tourist destination for domestic and international visitors. In addition, Etosha is part of the Protected Area Network [PAN], which is an organization that holds land in trust intended to restore the ancient migration patterns for wildlife. These progressive attitudes of the Ministry of Environment and Tourism and Namibia Wildlife Resorts along with the flow of thousands of domestic and international tourists makes Fort Namutoni at Etosha National Park an ideal location for the installation of site-specific artworks. The artists involved in the expressing.etosha art project drew inspiration for their work from the natural beauty of the Park, its natural resources, and its history, real or mythical. In keeping with the important educational component of the Ministry of Environment and Tourism, expressing.etosha included three students whose professional development was enhanced by learning about collective projects and public art commissions. Hercules Viljoen has been a professional artist for more than two decades and is familiar with public commissions and site-specific works having produced several over the course of his career. Through his position as Chairperson of the Department of Visual Arts at the University of Namibia, he has had an enormous impact on the development of a number of young Namibian artists. Viljoen’s work called Etosha Sympathetic Magic enables the viewer to physically, intellectually and emotionally experience a part of the Fort’s history. In a dark cramped cell where prisoners were once incarcerated, Viljoen installed numerous life-size photographic images of human figures, taken from archival photographs of the original inhabitants of the Etosha area. The large forms crowded in the tiny cell confront the viewer with the reality of physical confinement and evoke the feelings of psychological entrapment. Sections of wire mesh reclaimed from the Fort’s restoration that contain bits of plaster and miniature animals were suspended like spider webs from the ceiling to increase the feeling of endless internment and passing time. The innovative use of light [black light] creates a mystical and unsettling experience, as does the necessity to stoop down to peer through a small opening in the old wooden door at the front of the cell to see the installation. Imke Rust, whose previous body of work dealt with memory and history, drew on the San myth that describes the origin of the Etosha Pan in her piece entitled Weeping Women. The myth states a group of strangers moved into the region that is now the Etosha Salt Pan and killed all the men and children of the people originally living there, but left the women to mourn the death of their loved ones. The women cried so many tears they formed a large salt-water lake. When the lake dried up, the Etosha Pan was formed. For her installation, Rust created seven life-size figures made of vertically stacked salt blocks to symbolize the devastated women. The rough textured surface of the salt block alludes to the tenacity of women, and their ability to survive great hardship. Salt has a direct reference to the Pan, and human bereavement, but also calls to mind that throughout history salt was used to preserve foods, was a symbol of hospitality, and had great medicinal, religious, and economic significance. Small type-written notes are attached to rocks that encircle the Weeping Women with the messages: “salt sal-vation,” “washing away the past, the hurt, the sorrow, the pain, the broken heart,” and “great white place,” evoking the mythical and literal history of the region and the importance of salt to human and animal survival. The Weeping Women, like many site-specific works considers materiality and the environment. Seasonal rains will erode the figures, transforming their shapes and eventually sending the salt back to the earth, while simultaneously reenact the myth as the rainwater mixes with the salt and creates the natural tear solution once shed by mythical founders of the Salt Pan. Shiya Karuseb, a deeply spiritual multi-media artist, uses humanity’s historical path as a point of departure for his work. In Stone Path, Karuseb constructed a limestone path and gateway that symbolizes the evolution of human spiritual development. The artist equates the variation of density and durability of stone to mankind’s progression toward peace and social stability. The limestone path represents the intermediate or current period of social and spiritual development where man has just begun to learn to reconcile differences without violence or war. The area on the other side of the gate symbolizes the ‘marble period’ where war and violence are no longer a solution to conflict resolution in a utopian society. Karuseb created what he calls a path of history marching towards a brighter future; however, the obstruction in the middle of the gateway implies that to arrive at this future will not be without obstacles and hardship. The artist used reclaimed limestone from the old buildings around Fort Namutoni to make a direct historical reference to the past. Red paint on the sides of each stone on the path refers to the bloodshed and pain of the previous period of human evolution and Namutoni’s history. Karuseb’s Stone Path is an optimistic work that advocates reconciliation while simultaneously acknowledging the past. Jost Kirsten, an accomplished sculptor from Swakopmund and Standard Bank Biennale winner, also refers to Namibian history and incorporates reclaimed objects. Dream II refers to violent conflicts in the past over land and resources in the region. The artist points out that colonialism, imperialism, and forcible land acquisition are horizontal movements, and in contrast he selected a vertical form to memorialize the resolution of conflict. The column’s verticality is a visual metaphor for hope, optimism, and a stimulus for dreams, which the artist believes are vertical and directed upward. The height and upward thrust of the installation encourage the viewer to dream, remember, and imagine a positive personal and collective future. Kirsten often uses repetitive forms and recycled materials in his work; however, they are meticulously transformed and arranged so the intrinsic organic qualities of the materials are not lost in the process. Kirsten’s column is made up of reclaimed Purple Heart wood that was left over from the construction of the decks around the Fort, which the artist assembled into square forms that are reminiscent of the Fort’s block-like architecture. The squares are stacked to a height of almost four meters, and at intervals along the column, Kirsten has grinded black geometric linear and textural patterns into the column, which also echoes the black base. The black metal section of the sculpture supporting the upper portion of the column is carefully considered and adds a monumentality and significance to the entire installation. In stark contrast to Kirsten’s vertical forms, Wiebke Volkmann’s Port of Un-knowing significance is in its horizontal orientation that draws the viewer closer to the earth. Her eclectic background in environmentalism and sustainable development is evident in this installation as she equates the fragility and wellness of human body to the plight of the earth. Volkmann’s Port is a bed of reclaimed and natural materials; the pillows are made of old electric insulators that are incased in ‘pillowcases’ woven from reclaimed copper wire, the duvet cover made from a variety of historical Namutoni Resort bed linen is filled with organic material and seeds that will continuously germinate and grow through the embroidered paw and hoof print shaped openings in the duvet. The organic bed is framed by a carpet of flattened automobile tires in the shape of an animal skin. A window at the head of the bed is laced with curvilinear metal forms that grow into the sky like the branches of a tree. The multifaceted symbolism of Volkmann’s ‘bed’ draws our attention to man at his most content, while he rests, dreams, and rejuvenates, but also when he is most vulnerable, asleep or ill. The artist draws a parallel to the earth, its beauty and seasonal renewal, which is contrasted with its vulnerability and fragility in the face of unbridled development in the 21st century. Volkmann’s Port of Un-knowing brings us in direct contact with the earth, urges us to become more intimately involved with nature and consider issues like pollution, the waste of natural resources, and global warming. The artist reminds us that our sensitivity to these problems is critical to the earth’s survival and ours. The concept of raising awareness about a precious resource is also addressed in the work of recent art graduate Helena Iitembu. Etosha means ‘open area of water’ in Oshivambo, and Blue Cracks is an abstract reference to that precious resource. Iitembu created one hundred semi-circular forms painted in hues of blue to depict the shimmering surface of water. The installation is carefully arranged in a U-shape form that brings to mind a large cup. For Etosha and the entire nation of Namibia, the careful management of water is critical for the survival of man and animal alike, and Iitembu’s Blue Cracks is a colorful reminder of this vital responsibility. Lionel Pietersen, a student of media and two-dimensional studies, explores yet another significant relationship between man and nature, the functionality and purpose of animal and man made structures, like termite heaps and the fort, and the potential to exhaust natural resources. Pietersen considers the necessity for sustainable integration of nature’s resources and manufactured goods in the post-modern period. In Untitled, Pietersen reclaimed large poles that are being used in the renovations at Fort Namutoni. Each of the three wooden forms is covered with a mixture of builders’ sand and epoxy combined with green and red-brown pigment. The color of the vertical forms blends into the deep earth tones of Etosha. The large bolts, electrical plugs, and switches embedded in the sand and epoxy mixture further emphasize the dichotomy of man-made and natural elements. The rough texture and protruding mass manufactured objects leaves the viewer wondering if a balance between sustainable development of natural resources and increased consumerism can be achieved; the artist optimistically suggests that it can. Kleopas Nghikefelwa, who has a diploma in theology and is currently a final year visual art student at the University of Namibia, uses a playful approach to a serious subject: the peaceful co-existence of man and animals, an issue that is paramount to the overall vision of Etosha. By using the childhood game called ‘hopscotch’, Nghikefelwa brings this important matter to the young and young-at-heart through the familiar social activity of game playing in the hopes of raising the awareness of the next generation. Nghikefelwa created eleven round concrete discs about forty centimeters in diameter. Juxtaposed on each disc are a human footprint and a leopard paw print that suggests the symbiotic relationship between man and animal. It also calls to mind the Chinese symbol of yin and yang, which addresses the necessity to have opposing forces in nature come together to find balance and harmony. These eight site-specific works are exciting, contemporary interpretations of Etosha National Park in the 21st century. They creatively address issues considered important by the Park’s administration and the public: preservation of natural resources, sustainable development, education, and history. The artists participating in the project employed complex conceptual thinking, an inventive approach to the use of reclaimed materials, and the creative integration of art and nature to challenge the public to think about themselves and their environment in a more insightful manner. Equally important, is the fact that these works are not in an elite and inclusive art museum or gallery, but in the country’s largest public game reserve, thereby communicating to a greater number of people. expressing.etosha is a testament to the insightful and creative thinking on the part of the artists and their sponsors, and will hopefully inspire others in Namibia to undertake and support similar projects.